I learned to drive at the relatively regular age of seventeen. By this point in my life, my parents had split up, and both of them drove manual transmission cars. This meant that I either learned how to drive a stick shift, or, well, take the bus for the remainder of my days. Now, driving may come naturally to many a-folk, but for me, the double whammy of being a new driver, and having to learn how to (properly) use a clutch, was a little overwhelming. I was the kind of kid that forgot which pedal was the brake, and which was the gas, much to the chagrin of every person who sat shotgun for the first couple of months of my driving career. So throw in a third, very finicky, but very integral mechanism within close reach of these already confusing foot-operated instruments, and you had a pretty excellent recipe for disaster. Recognizing the need for extra assistance, my mother signed me up for classes with the craziest driving teaching ever to grace the face of the planet. First, the name guy’s was named Shaf. Like, Shaft, but without the T.
Oh, and he didn’t have a last name. Anyways, the problem with Shaf was that, without telling me as much, he was doing the majority of the shifting/gear changing during our time together. This ended up giving me a crazy over-inflated sense of my own driving skills, so by the end of my third lesson, I thought that I had pretty much mastered every gear shift – not to mention the always trickiest thing to learn: getting the car going again WITHOUT STALLING after coming to a complete stop. With my giant ego in full effect, I told my mother that I was ready to start taking out our car for real-life practice runs. Luckily, she was still a little weary of just how far I could have progressed in a mere three hours, so she told me that I could take the car, but I could only drive around the parking lot up at UBC, and then the (maybe) five minute drive home, from the campus to our driveway. Also, I would be accompanied by my older sister, so she could both supervise, and give me pointers and tips as needed. Now, it should be mentioned here and now that Kate, though a terrific teacher, had recently undergone major surgery to repair a torn ACL, which made her competently incapable of taking over in case of an emergency. Well, if Vanessa doesn’t know how to drive when I drop her off at the parking lot, she certainly will by the time she leaves. Anyways, the afternoon ended up being a complete gong show and a half. The drive home was harrowing and a half – I tried everything in my power to never actually stop, for fear that I would never get the car going again, and then somehow ended up parallel parking the car in our driveway. But like all things in life, I eventually learned. Up until recently, my long-serving and much loved steed. I passed my learner’s test of my first try (the fact that I did it on a standard is this silly little gold star in my life that will never, not make me smile), and then passed my graduated licensing test, also on my first attempt. I even taught M how to drive stick shift in the early nascence of our courtship. 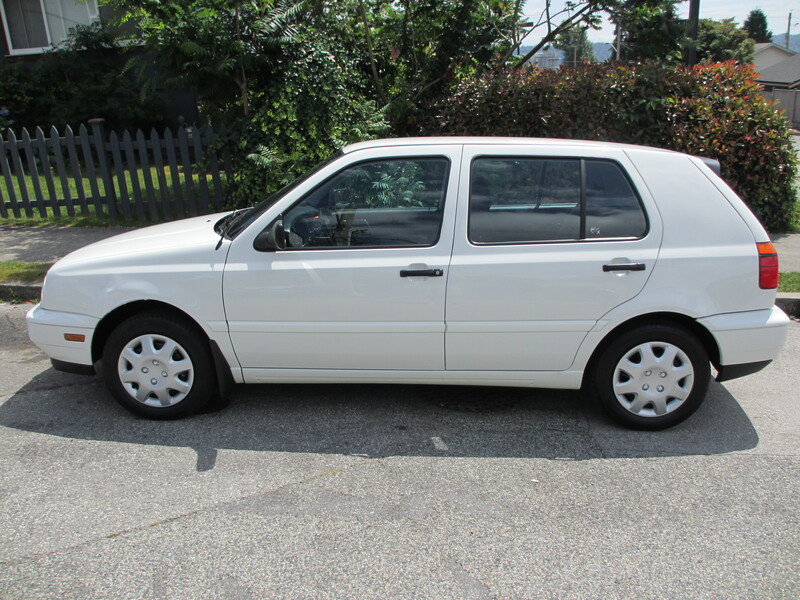 Now, I absolutely love driving, and can’t imagine myself ever commandeering anything but a manual car. But only when I stall. Which thank goodness, is rare indeed. It was the weirdest moment because upon reading this I actually felt like I needed to prove to the sign that I could actually, you know, speak English – like I had to show the (strangely) threatening advertisement that this was something I had already mastered. But then I kind of went completely nuts. In my mind I was all: HAHAHAHAHAHA! I already CAN speak English! English, English, English! Bet you weren’t exactly expecting THAT, were you, you sandwich board you! Not only that, but I can also speak French and have a highly unstable grasp of Russian and German! I AM THE MICHAEL PHELPS OF LANGUAGES. 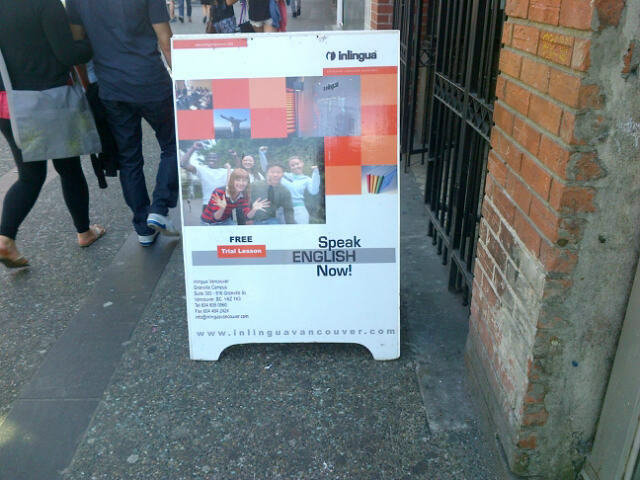 Also, on a slightly less bizarre note, shouldn’t the sign read “Learn English now!” and not “Speak English now”? I mean, anyone can speak a language – I could probably speak Korean or Portuguese as the day is long – I just wouldn’t know what the bloody heck it was that I was saying. And at the risk of sounding like the Old Spice Man, or Lady Gaga penning her obituary via Madlibs, it’s definitely always best to know the meaning of the words coming out of your mouth. I mean, if someone actually came up to me and told me they wanted my leather studded kiss in the sand I would think they were totes mcgotes cray-cray. And then I’d remember this day and concede defeat to the language school sandwich board. And then I’d make a sandwich.